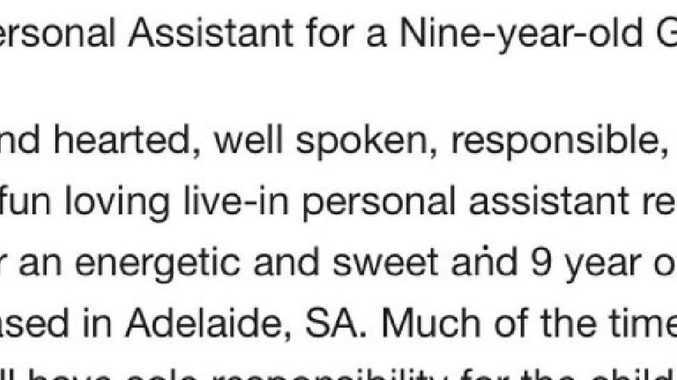 AN AUSTRALIAN mining company has posted an advertisement looking for a "personal assistant" for a nine-year-old girl. AusGold, owned by Chinese business woman Sally Zou, advertised the position on job search website SEEK. The job required a "kind-hearted, well-spoken, responsible, caring and fun-loving live-in personal assistant required for an energetic and sweet … nine-year-old girl based in Adelaide". "Much of the time you will have sole responsibility for the child as the mother travels frequently." However, people quickly noticed that the "personal assistant" role was very close in description to that of a live-in nanny. It is understood Ms Zou has two daughters and the ad was thought to be for her youngest child who was previously living in China. The "assistant" would be required to stay with the girl "7 days a week" during the school semester. The ad has since been removed from the website but it is not the first eccentric gesture the mining mogul has made for one of her children. Sally Zou is a Chinese business woman and is not afraid of using eccentric ads to her favour. The Zou family previously lived in Pymble on Sydney's North Shore but moved to Adelaide so her daughter, Gloria, could attend the prestigious St Peter's Girls School. In order to announce her arrival, Ms Zou took out a full-page advertisement in The Australian, which wasestimated to cost about $50,000. She also took out another full page ad in 2015 to mark Gloria's eighth birthday, along with throwing her a superyacht party in Sydney's Pittwater. 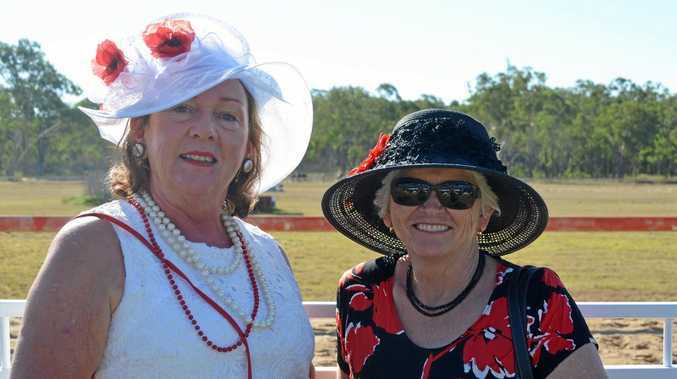 And if that wasn't enough, the guest list was filled with local celebrities and the whole event was documented by photographers and a film crew. Gloria’s full page birthday advertisement. The birthday ad - titled I shine … because of you! - contained a lengthy letter supposedly written by Gloria herself detailing how much she loves her mum, friends and teacher. 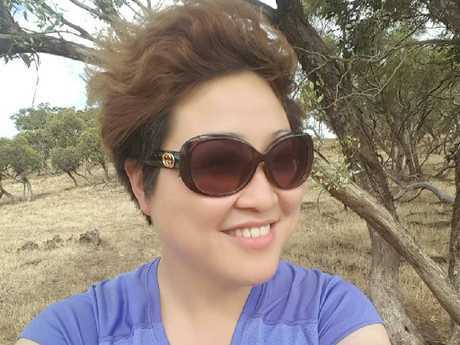 She even gave shout outs to Tony Abbott, South Australian MP Geoff Brock and Chinese Consul General in Sydney, Li Huaxin, affectionately referring to them all as "Uncle". "Dear Uncle Tony Abbott, do you still remember me? That three-year-old girl you carried through China Town in Sydney," the ad read. "That seven-year-old Chinese girl who wrote you a welcome letter for your visit to China and got a letter back from you? "It is you who lets me know 'everyone is equal and China and Australia are like a family'." 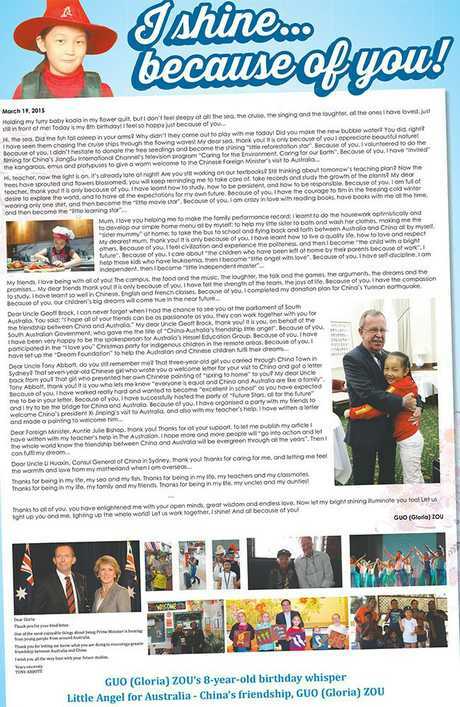 She also thanked Mr Brock for giving her the title of "China-Australia's friendship little angel".